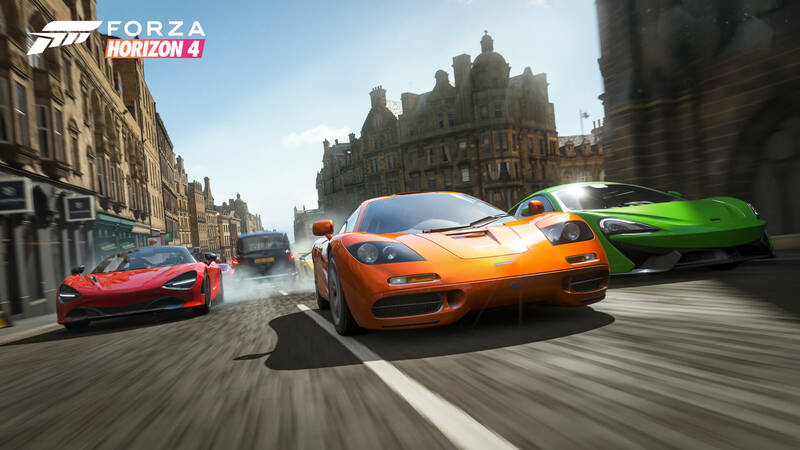 The Forza Horizon 4 Series 8 Update will arrive later this week, developer Playground Games revealed on its latest in-studio livestream broadcasted from Leamington Spa, UK. Headlining the Series 8 Update for Forza Horizon 4 is the arrival of the Barrett-Jackson Car Pack, alongside the all-new Drift Adventure mode that's making its debut this month with further improvements to Online Adventure to deliver a fairer, more balanced and competitive racing experience. These are all accompanied by a series of new unlocks available to earn from Festival Playlist over the next four weeks, including a batch of new exclusive cars, as well as an Easter-themed outfit and more! The Barrett-Jackson Car Pack will be available this week at no additional cost to Forza Horizon 4 Car Pass holders, which is included in the Forza Horizon 4 Deluxe and Ultimate Editions. It can also be acquired standalone for a price of $7. These vehicles originally made their debut in Forza Motorsport 7 at the beginning of the year and now, what are defined as some of the world’s greatest auctioneer cars can be collected, driven and customized in beautiful, historic Britain with their arrival into Forza Horizon 4. For more details on the Barrett-Jackson Car Pack, including a breakdown of all seven vehicles it features, be sure to check out our story on the Forza Motorsport 7 January Update. Those aren’t the only new cars arriving into Forza Horizon 4 this month, however, as the Series 8 Update also includes new exclusive cars to earn in the Festival Playlist. The 2018 Mercedes-AMG GT-4 is a 630hp, 4-door variant of the AMG GT that’s not only brand-new to the Forza franchise, but it’s also bulging of power and will be earnable in Summer with 50% Completion. Meanwhile, another chance to unlock the Hot Wheels Twin Mill 50th Anniversary Edition will be available at 80% Completion, whilst a new pick-up truck in the Mercedes Benz X-Class can be won in its designated Seasonal Championship. Autumn will be offering the 2012 Ferrari 599XX Evoluzione for 50% Completion, which made its return to the Forza franchise in February with its addition to Forza Motorsport 7. This legendary Italian automobile will be accompanied by the Mercedes-Benz 280SL, which is unlocked at 80% Completion. 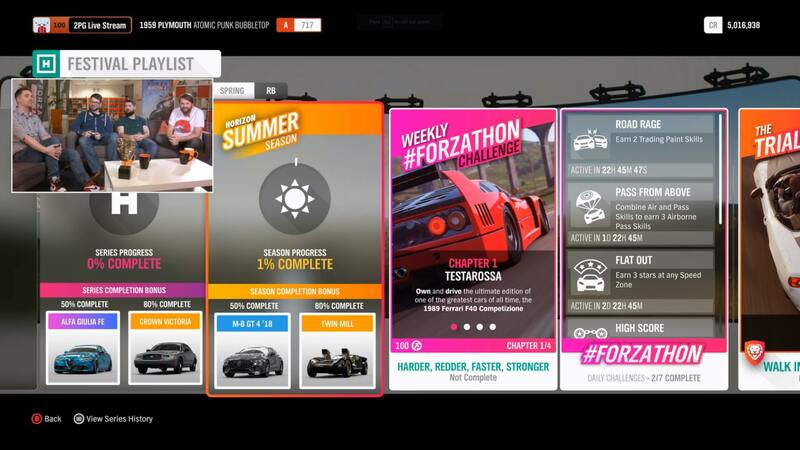 Meanwhile, the Winter seasonal program features the 1967 Chevrolet Chevelle at 50% Completion and the Lykan Hypersport at 80% Completion, but that isn’t the only Fast & Furious vehicle to earn this series, as the Terradyne Ghurka is making its return to the Forza franchise and can also be unlocked in its relevant Seasonal Championship. Finally, the 2009 Vauxhall Corsa – an iconic British car in every sense, will be available at 50% Completion during Spring with an exclusive Rabbit Outfit to celebrate Easter unlockable at 80% Completion. The Trial event will also be offering Rabbit Ears to accompany this unique, one-of-a-kind outfit – ensuring your character celebrates this special occasion in the most fulfilling way. As noted on the livestream, none of the cars available at 80% Completion this series are brand-new arrivals. Instead, they are exclusive cars that were available in previous events. This makes it easier for players to unlock all the new vehicles without having to complete all the required events and objectives within Festival Playlist. Those who do aim for overall completion in the Series 8 Festival Playlist will earn the Forza Edition variant of the Alfa Romeo Giulia Quadrifoglio at 50% Completion, with the classic Ford Crown Victoria available to unlock at 80% Completion. Meanwhile, the Monthly Rivals event for Series 8 features the 1984 Peugeot 205 Turbo 16 in a Group B Rally nostalgia trip. Playground Games also has a new Showcase Remix available for Series 8 in Autumn. 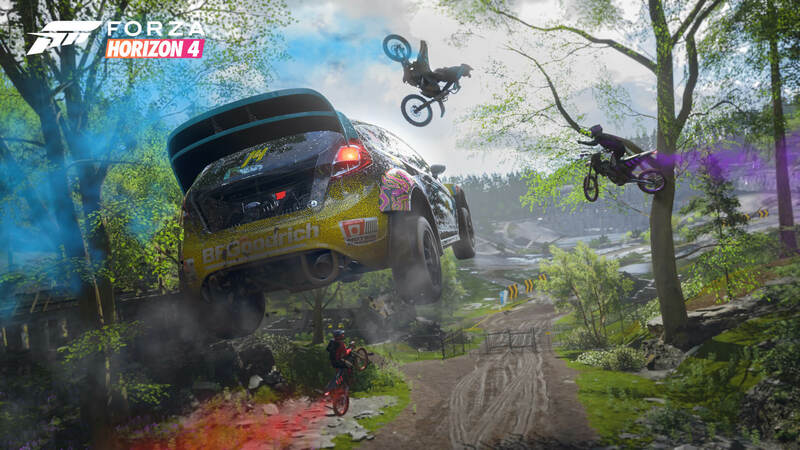 The Forest Sprite is a twist on the motorbike event showcased at the beginning of Forza Horizon 4 and sees you behind-the-wheel of a heavily-modified 1958 Austin-Healey Sprite, which comes equipped with a motorbike engine to make it ready for off-road driving in the forest. Playground noted that it wanted to really change the way this experience looked and felt – giving the player something a lot more fun and tactical to drive, whilst also examining the weather and time-of-day to double down on everything a Showcase Remix should be combined with fun difficulty balancing. That means it’s set at dusk during the Autumn season instead of Spring, but as a result of this, it’ll be available for one week only. This Showcase event is one of the most complicated available in Forza Horizon 4 due to it use of multiple vehicles. You’re racing against a group of motorcyclists in the middle of a forest, though from a behind-the-scenes development perspective, it’s technically one vehicle divided into four different points, which Playground noted to be quite challenging to balance and work with – an interesting insight into how the developer built this unique Showcase event. Furthermore, Playground said the dusk time setting used in Forest Sprite had been one of the ideas it originally considered for what this Showcase event could’ve been in Forza Horizon 4 at its release, though they felt it didn’t match their overall vision for the event. The Showcase Remix gave the team an opportunity to revisit the concept and execute it, giving all players the chance to try out the event for themselves. You can also still thread the needle using the 1958 Austin-Healey Sprite, too – but once again, keep in mind this unique twist will be available for one week only throughout the Autumn seasonal line-up, which begins on April 18th. 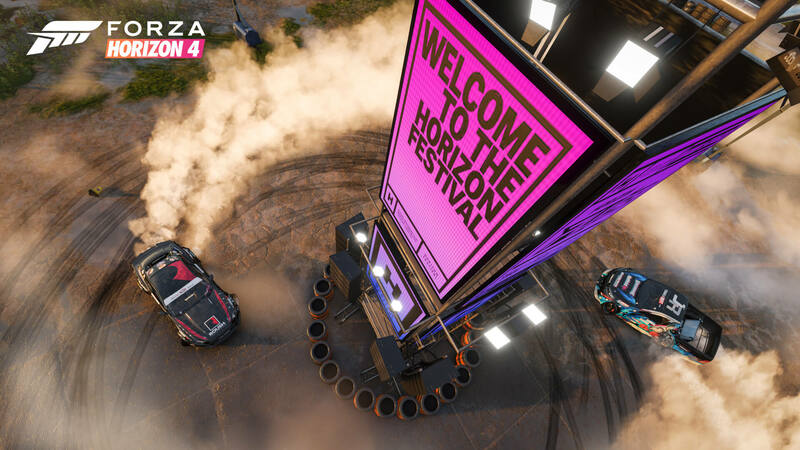 Drift Adventure is a new type of Online Adventure coming to Forza Horizon 4 with the Series 8 Update that sees you earn Drift Score around the asphalt racing circuits already present in the game. You’ll have a designated time of 7 minutes to set your best overall lap, though keep in mind this isn’t about the number of laps that you do – it’s all about your best lap overall lap with the most score earned. That’s the one that will be tracked and used to highlight your overall position against other players also partaking in the event. As you cross the finish line to commence a new lap, the game will update the leaderboard with the current positions of each player. Both AWD and RWD events will be featured in Drift Adventure with a curated line-up of classes chosen by Playground Games. It’ll be up to players to choose their own specifically tuned cars for these events. During its livestream, the Nissan 240SX was the car of choice recommend for newcomers and experts alike by Chris Philips, Forza Horizon 4’s Senior Car Handling Designer. This is one of the most popular drift cars in the world, and he recommends hopeful drifters to swap the engine to a 6.2L V8 to deliver a flat, progressive torque curve. He also advises players to install a 2-way race differential along with race brakes to adjust the vehicle's brake balance. Drift suspension is a must for increased steering angle combined with a better suspension geometry to lose less camber when drifting. Finally, anti-roll bars can be used to stiffen up the car so you don’t easily lose control of it when sliding, whilst a Rocket Bunny kit can also be applied to complete the look and ensure you drift with style. Drifting in Forza Horizon 4 is also better in Series 8 with the arrival of the Drift Cockpit Camera, which was first introduced into Forza Motorsport 7 with the March 2019 Update. This feature was entirely built by Turn 10 Studios in Seattle, WA, and can be enabled via the HUD and Gameplay options in Forza Horizon 4. Players can then fine-tune the parameters for the sensitivity and camera movement to their liking, but it’s worth noting the default settings have already been trialled and tested by Turn 10. Additional details on optimizing the Drift Cockpit Camera to your liking can be found in the story we originally published for this feature when it first arrived into Forza Motorsport 7 last month. The introduction of the Drift Cockpit Camera will be undoubtedly perfect for sliding sideways in Drift Adventure, which bases its scoring system from the revamped Drift mode added to Forza Motorsport 7 last year. This means points are earned by not only the angle of your car when drifting, but also your overall speed. Therefore, you’ll want the most angle possible combined with the highest speed, though keep in-mind the 90MPH limit – no point bonuses are awarded for speeds above that threshold. Points can also only be earned if your wheels are on the road or pedestrian pavements in the case of Edinburgh, whilst you can’t turn around to earn more points as this will simply dirty your lap. Should you accidently spin out, however, you won’t need to worry about the lap being invalidated as the game will only mark it dirty should you drive back a far distance. This makes Drift Adventure’s scoring policy far more lenient than Drift Zones. Collisions have also been disabled in Drift Adventure, so you don’t need to worry about other drivers attempting to ruin your lap as they’ll simply appear ghosted instead. Each Drift Adventure is made up of 3 events that last for 7 minutes each. These are grouped by weather scenarios to match each season, which have been purposely made predictable, so you always know what to expect from the conditions throughout each event. Drift Adventure is available in both Ranked and Unranked variants and is all free-for-all based, so don’t expect any teams in this one. It’ll also count towards the Ranked objective in the Festival Playlist and joins the Team Racing, Team Games and Free-for-All Racing Adventure modes that already exist in Forza Horizon 4. Speaking of which, developer Playground Games also outlined a series of improvements for each of these experiences to deliver a fairer, more balanced and competitive racing experience. Firstly, collisions have been disabled for the first 30 seconds of each race to make it a lot less frustrating and stressful for players. It also gives the grid the opportunity to spread out more as the race progresses. Secondly, the developer has removed the S2 class from Dirt races, whilst B Class has been added in place of it. Finally, the controversial Freeroam Rush experience in-between events has been removed from Road Racing asphalt championships, though it still exists for Dirt and Cross Country races. Playground Games also noted that its promised “wall-riding fix” will not be included in the Series 8 Update. Instead, it’ll be available in Series 9 alongside a new anti-griefing system, which discourages non-sportsman behaviour. 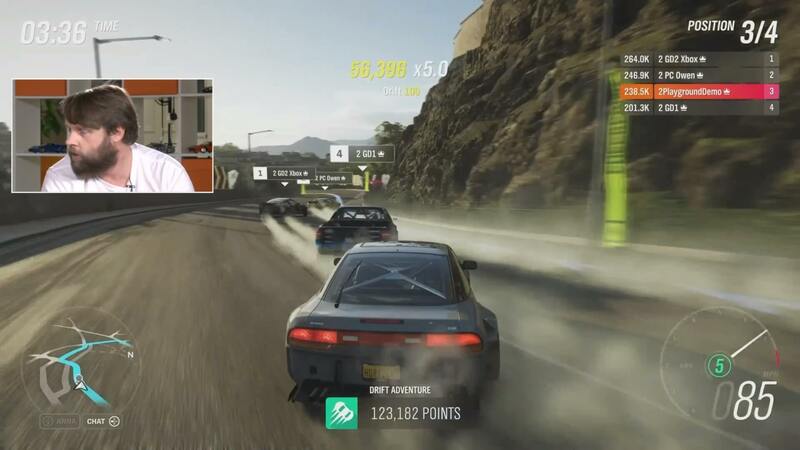 The developer noted that multiple things combine to create issues in online racing, but it has been looking into ways it can ghost cars to alleviate collisions between vehicles, specifically those intended to drive players off the track or into a wall. Lookout for more details on this new feature next month ahead of its arrival in the Series 9 Update, which will be accompanied by another take on the Online Adventure formula that’s tentatively titled Custom Adventure. This feature, which is taken from Forza Horizon 3, will allow players to specify the type of adventure to participate in and choose the car class they wish to compete in. Playground Games has added wheel-space options to over 100 new cars in Forza Horizon 4 with the Series 8 Update in response to fan-feedback. This means every car that could reasonably support wheel-spaces now has them. Furthermore, a new tool has been made available to painters in the Livery Editor, and it’s a big one. Layer Masks will allow players to create their own “cookie-cutter shapes” for the first time. This means you can now change the body-paint underneath a mask shape, and have it come through all the layers stamped through the vehicle. 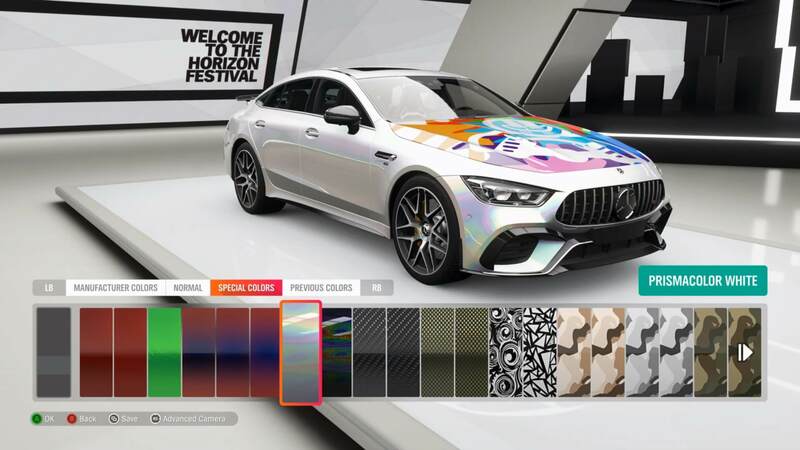 This would’ve previously taken hours to achieve in the past and it allows designers to use special paint colours with liveries that were otherwise previously impossible. Meanwhile, a small tweak has been made to Playground Games Seasonal Championships, which sees them conclude after the “best of five” has been achieved. This means you don’t have to play additional rounds after a team has been determined as the tournament winner, which should alleviate some frustration from players who partake in these events. That’s everything featured in the Forza Horizon 4 Series 8 Update. Lookout for it to be available later this week on Xbox One and Windows 10 PC. Featuring the vehicles of the Barrett-Jackson Car Pack with an array of new arrivals to the Festival Playlist, not to mention the promising new Drift Adventure mode and the beneficial improvements added to Online Adventure, this is one of the most comprehensive releases yet for Playground's critically-acclaimed shared open-world racer – officially dubbed as the “Best British Game” at the 2019 BAFTA Game Awards.